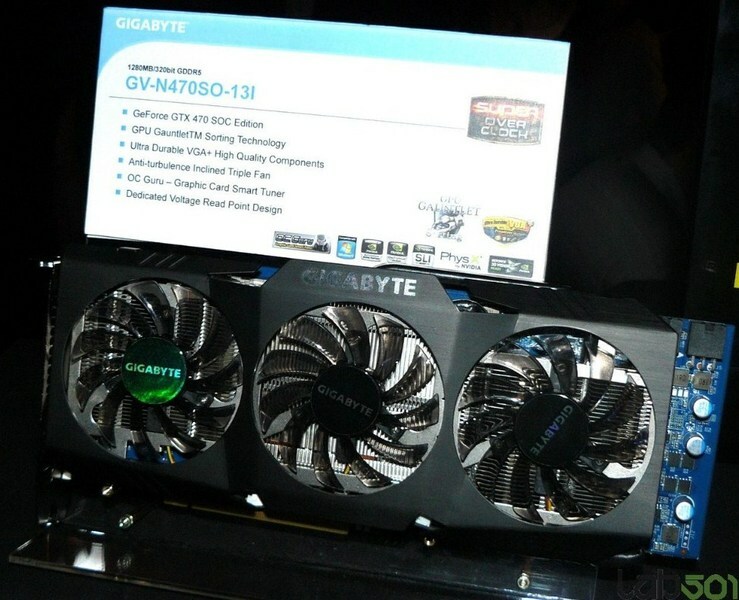 Gigabyte displayed its high-end non-reference GeForce GTX 470 based graphics card, the GTX 470 SuperOverclock (GV-N470SO-13I). The card is built using Gigabyte's Ultra Durable VGA Plus (UDV+) technology, and makes use of a 12+2 phase VRM, because of which the PCB is about as long as a GTX 480. The GPU and memory chips used are said to be hand-picked (by binning), to have the highest overclocking potential. The GPU cooler used is no less complex, making use of a large aluminum fin array that's cooled by three fans that's are slightly inclined to reduce turbulence. There is no word on the clock-speeds, though being an SOC model it will likely be on the higher side. Anyone know what the reference design Phase VRM is? This card is a very nice non-reference design. How big is this thing? Maybe it's an optical illusion or something but it definitely looks a lot bigger than the reference 470 with its one tiny fan. Oh yea, and noob question, what's phase vrm and how does the bigger numbers make it better for overclocking (Like 12+2 vs 4+1)? Seems like the reference 470s overclock fine. I guess I'm confused by the numbering system; 4+1 vs 12+2 What do each correlate too? Well, of course! Because an OC GTX470 will consume more power than the CPU/mainboard it is paired with. Personally, I dont like the idea of ubersuperoverclocking an already power hungry GPU. We all know that OC'ing improves performance but at the same time performance/watt gets worse; it uses ever more power to get the extra stretch. 12 vGPU and 2 vMem. There are independent circuits to power the GPU and memory. Yeah but that didn't rhyme! Kidding, I'll do some research and learn some more. why don't they just call this the "e-peen" edition? Because "e-peen" does not contain the word "Super!" or "Overclock!" Lol, I was thinking the exact same thing. Next think you know it would be something even cooler like Supabigmommaoverclock!